WEST LAFAYETTE, Ind. 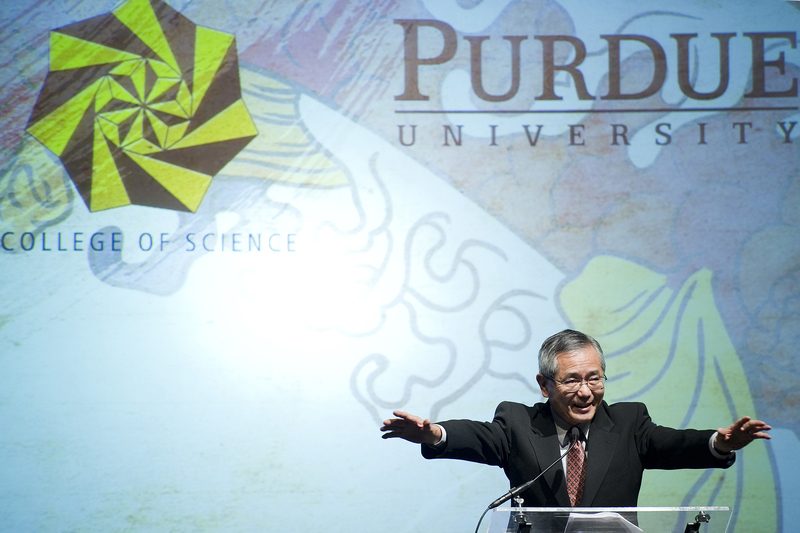 - Ei-ichi Negishi, winner of the 2010 Nobel Prize in chemistry, will lead a new research institute at Purdue University focused on catalytic organometallic chemistry. Purdue President France A. Córdova announced the creation of the institute, named the Negishi-Brown Institute after Purdue's two Nobel Prize-winning organic chemists, on Thursday (Feb. 3) at the Ei-ichi Negishi Nobel Laureate Celebration Dinner in the Purdue Memorial Union. "Ei-ichi Negishi made history as he followed in the footsteps of his mentor Herbert C. Brown to win the Nobel Prize in chemistry, but he never stopped looking toward the future," Córdova said. "He has high aspirations for himself, his fellow chemists and the scientific community - truly embodying the university's mission and the late professor Brown's own ideals. The Negishi-Brown Institute will continue the legacy of improving the world through advancements in organic chemistry set forth by professors Brown and Negishi." Negishi, the Herbert C. Brown Distinguished Professor of Chemistry, is the institute's inaugural director and will develop a detailed vision and long-range plan for the institute. "Fundamental research is the foundation of scientific achievement and drives meaningful advancements in important areas such as climate, food security and drug development," Negishi said. "We must build on what we have already discovered to help people and advance technology in ways that we can only imagine today. Fundamental research done here at Purdue will send ripples throughout the world in terms of interesting and important developments and applications." The institute will support basic research in catalytic organometallic chemistry through graduate and postdoctoral fellowships, regular workshops and symposia, and establishing new relationships with industrial partners, he said. Negishi said he plans to focus his research on chemical reactions using the same group of metals from his earlier Nobel Prize-winning work. "The d-block transition metals that I've studied, such as palladium, titanium, nickel, copper and rhodium, are extremely useful for chemical transformation and there are many more new, beneficial things to come from them," he said. "In the future I believe such reactions could lead to a chemical way to perform photosynthesis. Instead of trying to mimic nature, we would come up with a chemical approach. For instance Nylon, a synthetic fiber, is not a copy of silk, but it serves a similar function and has the advantages of being stronger and cheaper to produce. It would be an incredible benefit to humankind to be able to turn the harmful greenhouse gas carbon dioxide into useful glucose, and that is where I see my future work." Jeffrey Roberts, the Frederick L. Hovde Dean of the <?xml:namespace prefix = st1 ns = "urn:schemas-microsoft-com:office:smarttags" />College of Science, said the strength of Purdue's Department of Chemistry will serve as a foundation for the institute. "That Purdue's two Nobel Prize winners have come from the organic chemistry group underscores its and the entire chemistry department's heritage of talented researchers," Roberts said. "Through the Negishi-Brown Institute, Purdue's pre-eminent researchers will collaborate with researchers throughout the world to advance scientific understanding and address the world's grand challenges." Negishi received the 2010 Nobel Prize in chemistry for developing chemical reactions that allow for easy and efficient synthesis of complex organic compounds that are used in everything from pharmaceuticals to electronics. In addition to drugs that include the painkiller naproxen and the cancer treatment taxol, the Negishi reaction has been used to produce fluorescent marking that has been essential for DNA sequencing and in creating materials for thin LED displays. Negishi grew up in Japan and received a bachelor's degree in organic chemistry from the University of Tokyo in 1958. He moved to the United States in 1960 to attend graduate school at the University of Pennsylvania as a Fulbright-Smith-Mundt scholar, earning a doctorate in organic chemistry in 1963. Negishi came to Purdue in 1966 as a postdoctoral researcher under the late Herbert C. Brown, who won the Nobel Prize in 1979. Negishi went to Syracuse University in 1972, where he was an assistant professor and then an associate professor before returning to Purdue in 1979.